The Federal Reserve is the primary obstacle to reducing income/wealth inequality. Those who support the Fed are supporting a neofeudal arrangement that widens the income/wealth gap by its very existence. The issue of income/wealth inequality is finally moving into the mainstream: which is to say, politicos of every ideological stripe now feel obliged to bleat platitudes and express cardboard "concern" for the plight of the non-millionaires with whom they personally have little contact. 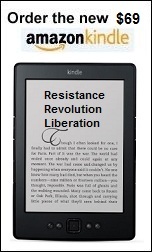 I have addressed the complex causes of rising income/wealth inequality for years. 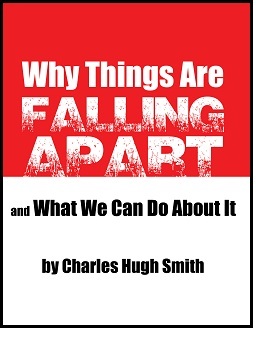 Indeed, my book Why Things Are Falling Apart and What We Can Do About It is largely about this very issue. Here is a selection of the dozens of entries I have written about rising income/wealth inequality. 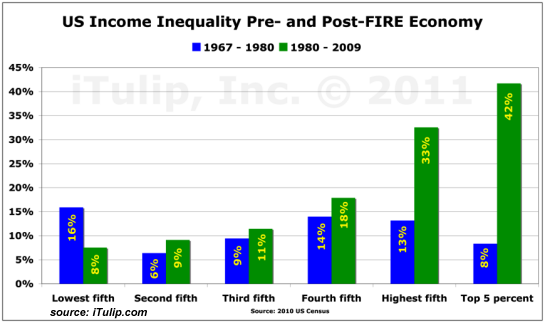 While many key drivers of declining income are structural and not "fixable" with conventional policies (globalization of labor and the "end of work" replacement of human labor by robots, automation and software, to name the two most important ones), the financial policies that create wealth/income inequality are made right here in the U.S.A. by the Federal Reserve. We should start addressing wealth/income inequality by eliminating the primary source of wealth/income inequality in the U.S.: the Federal Reserve. 1. Zero-interest rates (ZIRP) and limitless liquidity creates cheap credit that enables the super-wealthy to buy rentier income streams that increase their wealth. The closer one is to this gargantuan flood of "free money for cronies," the wealthier one can become by borrowing from the Fed for near-zero and buying assets that yield returns well above zero. If your speculative bet goes bad, the Fed will bail you out. 2. Zero-interest rates (ZIRP) and limitless liquidity feeds financialization, broadly speaking, the commoditization of debt and debt instruments. 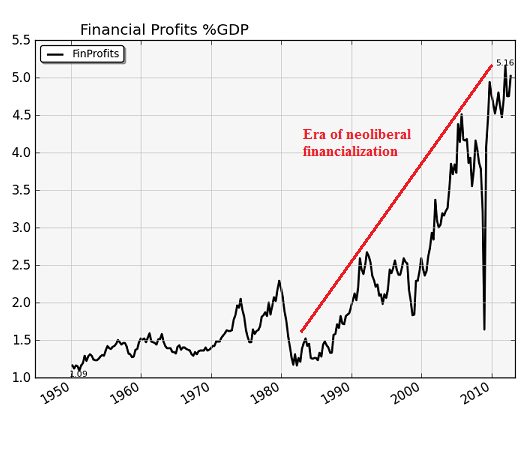 The process of commoditizing (securitizing) every loan or debt greatly increases the income and wealth of the financial sector and the state (government), which reaps higher taxes from skyrocketing financial profits, bubbles and rising asset values (love those higher property taxes, baby!). 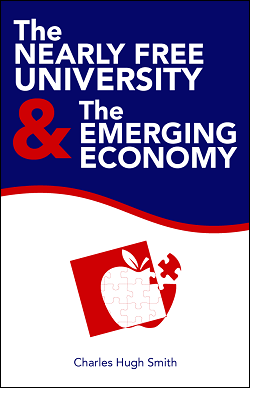 There is no persuasive evidence that cheap credit enables legitimate wealth creation, while there is abundant evidence that cheap credit fuels speculation, credit bubbles and a variety of financier schemes and scams that create temporary phantom wealth for crony capitalists and impoverishes everyone who wasn't in on the scam. The housing bubble was not just a credit bubble; it was a credit bubble enabled by the securitization/financialization of the primary household asset, the home. Those closest to the Fed-enabled flow of credit reaped the gains of this financialization (or were subsequently bailed out by the Fed after the bubble burst), while the households that believed the Fed's shuck-and-jive ("There is no bubble") suffered losses when the bubble popped. This chart of income inequality depicts the correlation between the Fed's easy-money credit expansion and the extraordinary increase in income inequality. Please note the causal relation between income and wealth; though it is certainly possible to squander one's entire income, those households with large incomes tend to acquire financial wealth. Those with access to cheap credit are able to buy income-producing assets that add to their wealth. As a direct result of Fed policy, the rich get richer and everyone else gets poorer. 3. But that isn't the end of the destructive consequences of Fed policy: the Federal Reserve has also created a neofeudal society in which debt enslaves the masses and enriches the financial Elites. Put another way, not all wealth is created equally. Compare Steve Jobs, who became a billionaire by developing and selling "insanely great" mass-market technologies that people willingly buy because it enhances their lives, with a crony-capitalist who reaps billions in profits from risky carry trades funded by the Fed's free-money-for-cronies policy or by selling phantom assets (mortgages, for example) to the Fed at a price far above market value. Clearly, there is a distinction between those two fortunes: one created value, employment for thousands of people, and tremendous technological leverage for millions of ordinary people. The other enriched a handful of financiers. This financial wealth could not be conjured into existence and skimmed by Elites without the Federal Reserve. This Fed-enabled financial wealth destroys democracy and free markets when it buys the machinery of governance. To the best of my knowledge, Jobs spent little of his time or wealth lobbying Big Government for favors, special laws eliminating competitors with regulatory hurdles, etc. Compare that to the millions spent by the "too big to fail" banking industry to buy Congressional approval of their cartel's grip on the nation's throat: Buying Off Washington To Kill Financial "Reform". Much of the debate about wealth inequality focuses on whether the super-wealthy are "paying their fair share" of the nation's taxes. If we refer to the point above, we see that as long as the super-wealthy can buy the machinery of governance, then they will never allow themselves to be taxed like regular tax donkeys. Unfortunately, only the top 1/10th of 1% can "afford" this kind of Fed-funded "democracy." As of 2007, the bottom 80% of American households held a mere 7% of these financial assets, while the top 1% held 42.7%, the top 5% holds 72% and the top 10% held fully 83%. Since all these distortions originate from the Fed, the only solution is to abolish the Fed. Those who have absorbed the ceaseless propaganda believe that an economy needs a central bank to create money and manage interest rates. This is simply wrong. The U.S. Treasury (a branch of government actually described by the Constitution, unlike the Fed) could print money just as it borrows money. Should a liquidity crisis squeeze rates higher, the Treasury has the means to create liquidity and make it available to the legitimate financial system. All the Fed's regulatory powers were power-grabbed from legitimate government agencies defined by the Constitution. 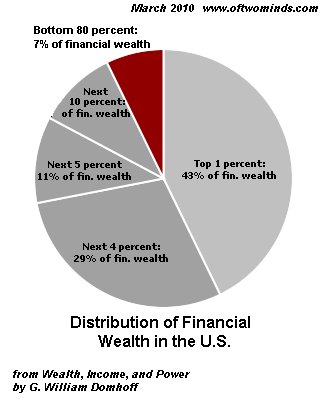 The Federal Reserve is the primary engine of income/wealth inequality in the U.S. Eliminate "free money for cronies," bailouts of the "too big to fail" banks that own the Fed, manipulation of markets, the purchase of impaired private assets at high prices, and all the other tools of financialization the Fed wields to enforce its grip on the nation's throat--in other words, abolish the Fed--and the neofeudal structure that feeds inequality will vanish along with the feudal lords that enforced it. We don't need to "fix" things as much as remove the obstacles that are blocking the way forward. The Federal Reserve is the primary obstacle to reducing income/wealth inequality. Those who support the Fed are supporting a neofeudal arrangement that widens the income/wealth gap by its very existence. Thank you, Poet ($25), for your most generous contribution to this site-- I am greatly honored by your support and readership.